The latest data on income trends is a clear indication that recent measures to boost the wages of low-income workers are seeing some results, observers said yesterday. The bottom 10 per cent of families with at least one working member clocked the fastest real income growth last year at 10.7 per cent, a report by the Department of Statistics said. The average income of this group rose 24.6 per cent between 2010 and last year - the highest among all income groups. But from 2005 to 2010, their wages rose by only 9.6 per cent - the lowest increase of all income groups. "The Government has moved from the centre to more centre-left, and its fiscal policy is now more redistributive than in the past," said MP for Pioneer Cedric Foo, who is deputy chairman of the Government Parliamentary Committee for Finance and Trade and Industry. "This makes for a stable society - you cannot have income distribution that is too wide," he added. Concern over stagnant wage growth for the poorest workers a decade ago saw the Government adopt measures to help them, such as the Workfare Income Supplement to boost wages. The labour movement also adopted a progressive wage model to boost pay in sectors such as landscaping and security. More recently, rules on hiring foreign workers who depress wages at the lower end were also tightened. Bank of America Merrill Lynch economist Chua Hak Bin attributed the rise in incomes at the bottom to the tighter regulations, which he said have driven wage growth. Comparatively, the latest income report in the United States last September shows the bottom 10 per cent of families there earning 2.6 per cent less in 2014 than they did the year before - continuing a downward trend that started in 2009. Singapore's Department of Statistics report noted that not all households stay in the same tier each year. But those with at least one working person in the bottom 10 per cent may seem well off by other measures. Last year, 16 per cent of them owned a car, 7.8 per cent employed a maid, and 6.5 per cent lived in private property. Four in 10 of those at the bottom 10 per cent were headed by someone aged 60 and older. The report added that families may move between bands, for example, when someone is temporarily unemployed in one year and then goes back to work in another. Incomes last year rose across the board, with median monthly household incomes rising to $8,666 from $8,292 in 2014 - a 4.9 per cent jump after adjusting for inflation. Singapore residents got an average of $3,985 each from various schemes like income tax rebates and MediShield Life subsidies, up 13 per cent from $3,515 in 2014. Professor Euston Quah, who heads Nanyang Technological University's economics department, said it was evident "the transfers are working to help the lower- income class". "The most important thing is that without the subsidies, they will be worse off. And this help does not come for free," he added, referring to progressive tax policies. 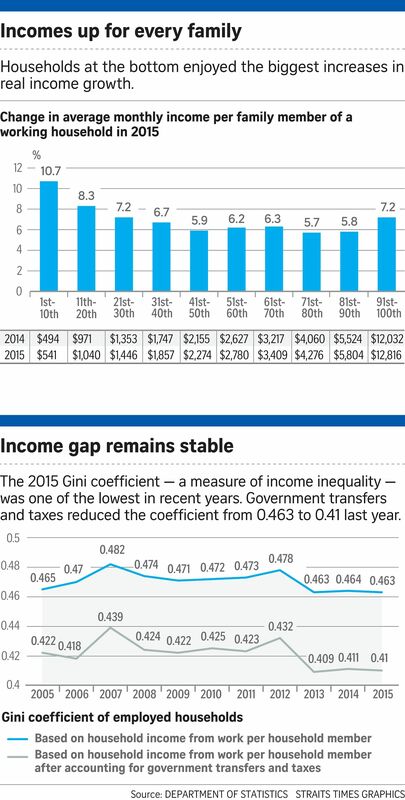 The result: The Gini coefficient, a measure of income inequality, remained relatively stable at 0.463 last year, down from 0.464 in 2014. After taking into account government handouts, the figure dipped to 0.41 last year, from 0.411 in 2014. Other tiers that recorded the fastest growth included those in the 11th to 20th percentile (8.3 per cent). Those in the 21st to 30th percentile and top 10 per cent each saw income growth of 7.2 per cent. Prof Quah said the greater percentage rise for lower-income earners could be due to their lower base. Mr Foo added that more could also be done to raise wages for families in the middle- and higher-income brackets. "We need to maybe tighten regulations for Employment Pass holders," he said, citing how some sectors and companies appear to hire a disproportionate number of foreigners - a trend observers fear could dampen income growth at this end too.